Small size Federal Reserve Bank Notes (FRBNs) of 1929 was a one-year emergency issue. Issued in 1933 in denominations of $5, $10, $20, $50 and $100 denomoations, they all featured a distinct Brown Seal. Not all banks issued all denominations. Although they are all obsolete, most are still readily available for collectors. FRBN stars notes are highly sought after and are very rare in certain denominations. 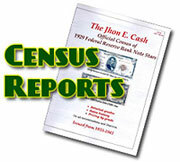 According to the Jhon E Cash Census, there are an estimated 1,215 star notes known. They differed from Federal Reserve Notes in that they could be redeemed only at the Federal Reserve bank that issued them. They were issued only as an emergency issue in 1933 using the same paper stock used for National Bank Notes. This emergency issue was prompted by the public hoarding of cash because of the many bank failures happening at the time. This also limited the ability of the ,National Banks to issue notes of their own. They were phased out within 2 years, but served their purpose dutifully. As small size notes, they have brown seals and serial numbers, the same as National Bank Notes of the era.